Septic tank grease problems have plaguing home owners, business and municipalities for decades. This article will briefly touch on the grease problems facing homeowners, businesses and municipalities on a national scale. We will also briefly discuss products that are available to safely reduce fats, oils and greases from systems eliminating grease odors and smells. Septic tanks and the grease problems that so often accompany them are here to stay. Grease, fats and oils are considered a natural by-product of food processing Industries. Grease products are lighter than water leading to a complete coverage of pipes and tanks as the waste water is drained off and recedes. Grease will leave a film from the top to the bottom of every surface it comes in contact with, eventually clogging the system creating unpleasant odors and backups. One of the more common grease problems facing homeowners is limiting the amount of grease that is dumped down the sink. Cooking with fats, oils and greases all contribute to the buildup of bio-mat in the septic tank and drain field. Bio-mat is a black tar like organic material that builds up in the sewage system and is the result of a lack of natural bacteria in the septic tank or sewage system resulting in a lack of digestion of the grease in the septic tank and drain field. Digestion is the natural process of septic systems ability for breaking solid down into an effluent before they flow out into the drain field. After the grease, fats and oils have digested into effluent, gravity will force the digested effluent out into the drain field to be further filtered by the soil returning to the water table. 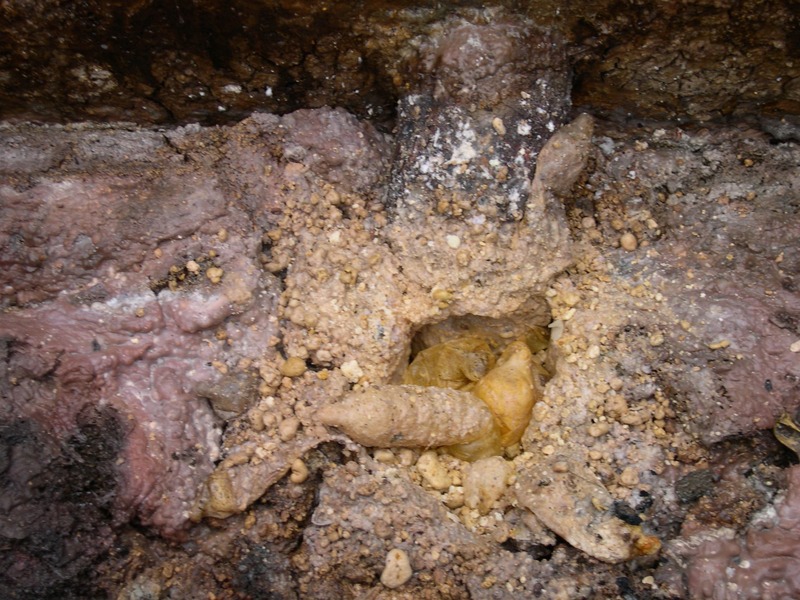 Septic tank grease problems come in many different forms. The most troubling is the restaurants and the food processing industry. These industries produce thousands of tons of grease each and every year with little means of disposing of it. The grease is eventually forced out into septic tanks and city sewer lines where the city then becomes responsible for processing the waste at a heavy expense to the tax payer. Cities and municipalities across the country have implemented rules and regulation governing the amount of fats, oils and greases a business can dispose of via the city sewer system. Efforts are currently being made to reduce the amount of fats, oils and greases being released into city sewer systems by restaurants and food processing facilities. Steps are also being made to monitor facilities and requesting the businesses submit to periodic inspections ensuring compliance. One proven method for reducing grease and the foul odors that so often accompany heavy accumulations of grease is regular dosing of grease trap treatments consisting of beneficial bacteria. Properly applied grease trap treatments will eliminate odors, reduce unnecessary pump outs, reduce sewer clogging, reduce bio-mat build up in septic tanks and drain fields and ensure a proper free flowing system giving the owner years of problem free service. What are Drain Fields made of?